Ever wanted to raise your own pet alien? Now you can in Oh No! 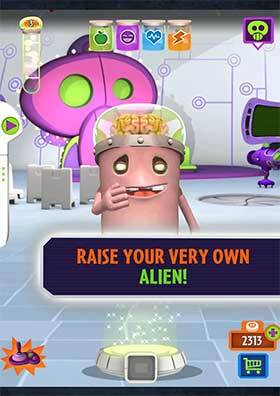 It’s An Alien Invasion: My Pet Brainling! Watch as your Brainling grows when you feed, play, dress and clean it! This cute little evildoer may get into trouble, but you’ll be there to save it. Just don’t wait too long, or he’ll get extra devious! • Earn coins by keeping your Brainling healthy, happy, energetic, and full! 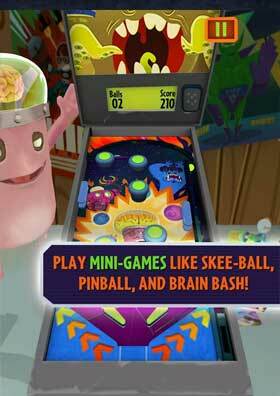 • Play mini-games like Skee – Brain, Pinball, and Brain Bash! 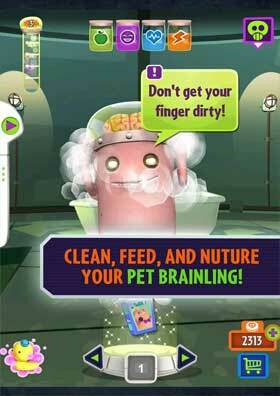 • Wash your Brainling, feed it snacks, and give it blasters to shoot! • Give your Brainling over 100 different meals, hats, shoes, hair styles, items of clothing and toys! • Farting is fun! Poke your Brainling and watch the gas pass! • Get free gifts and bonuses during your Brainling’s birthday!